I’m always looking at improving what I cook and how I cook it. In some cases, there are only so many ways you can do things…like scrambled eggs. That’s a pretty cut and dry cooking technique. However, other foods, like beef for example, have unlimited options when it comes to creating culinary masterpieces. With beef you can grill it, roast it, pan fry it, slow cook it, sear it, broil it, smoke it, boil it, and so on. Different cuts turn out better if prepared in certain ways but in general, you can pretty much cook beef however you please. Earlier this year I invested in a side of beef. It filled my entire upright freezer. I stared at some of the cuts wondering how I would prepare them. I typically stuck to cuts I knew and loved so I was really in for an adventure with various roasts and steaks which I knew nothing about. Things were going well in the beef preparation department until I got to the chuck steaks. They were thin cuts so I figured pan frying would be ideal. Nope – the meat turned out tough even though I only cooked it to rare. Same thing on the grill. And when it was smoked. And when I tried slow cooking the steaks. That darn chuck steak was determined to make me loose some teeth in it! I never once made it through an entire steak because my jaw started hurting. I had 20 pounds of chuck steak and another 15 pounds in chuck roasts. I just knew I HAD to do something with them, but what? Please note that product links are affiliate links. The price is the same for you! What? You have no clue what I am referring to? Well, neither did I just a few short months ago. While I had heard of the technique, I didn’t know that this was the official name of a cooking method basically involving an extended water bath for foods. 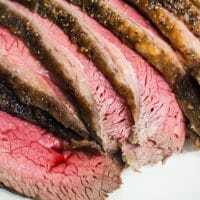 Sous vide (pronounced soo-veed) is a French phrase that is often translated as “under vacuum.” Essentially, you are cooking food in vacuum-sealed pouches, submerged in a water bath held at a precisely controlled temperature. The end result? Perfectly cooked food. And yes, it really is that simple. In fact, there are only four steps to achieving some of the best food you have ever made and eaten. You season your meal, you seal it up, you submerge and simmer it in the water bath, and you serve it. Some dishes are slightly more complicated than that. Some meats requiring pan searing at the end to brown them. Some recipes require a bit of work on the front end to create a sauce or marinade. But in general, there is only about 30 minutes of hands on work. Ok – onto this recipe. I think you will love it, especially because you can pretty much use any cut of beef for this. However, I chose to use chuck steak since it is a tougher piece of meat that can benefit from sloooooooow cooking. My Puerto Rican Sofrito Chuck Steak turned out divine! See that picture up there? Talk about TENDER chuck steak. My word! It was melt in your mouth. I have never had that with a chuck steak before. 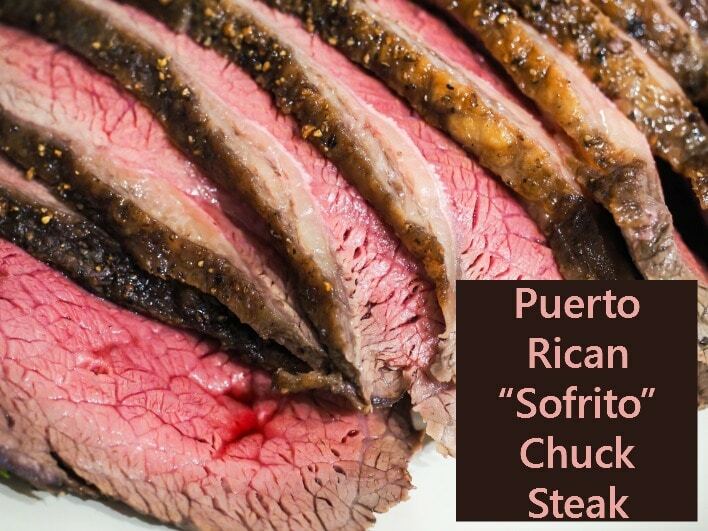 So let’s get to making this tasty Puerto Rican Sofrito Chuck Steak shall we? Chuck steak and it's finest! This slow cooking chuck steak emboldened with the flavors of Puerto Rico will soon become a family favorite. Slice the peppers into four parts. If using the aji dulce peppers, cut them in half. Peel and slice the onion into 8 parts. Peel and pull apart the garlic. Place peppers, onion, and garlic on a baking sheet lined with parchment paper and drizzle with olive oil. Roast for 20 minutes. Chop up the recao leaves and cilantro. Place ALL of the sofrito ingredients in a food processor or high powered blender and process until it looks like chunky salsa. Rinse your chuck steaks or chuck roast under cool water and pat dry with paper towels. Using a sharp tipped knife, make about a dozen tiny little punctures in the roast/steaks. You do not want a through-and-through puncture. Just barely nick the meat. Rub both sides of the meat with the sofrito mixture, using about 1/4 cup per pound of meat. Vacuum seal as per the directions on the Sous Vide vacuum sealer. Set your Sous Vide to 138 degrees F.
Once the water has heated, place the roast/steaks in the Sous Vide. Let them have a nice water bath for 24-48 hours. I typically take mine out around the 36 hour mark. You can pan sear or quickly (1 minute per side) grill the steaks to get that nice “steak” color. This isn’t mandatory but most people aren’t used to the pink steak color. Please note that this is the family friendly version. I left out the super-hot, fire in your mouth Aji dulce peppers. If you would like to use them and increase the heat, go right on ahead. This recipe makes enough sofrito for about 6-8 pounds of meat. I freeze the leftovers to use later. I would love to add an Excalibur dehydrator to my real food kitchen. Love that recipe. Blender would be my choice! I would love the Dehydrator. I would love to win the dehydrator. It is something that would save me so much time and would definitely save money! I’d like to win the Blendtec to try my hand at making baby food for my nephews! I’ve heard of sousvide cooking for quite a while now, but thought it was just for the commercial foodie kitchen. Thank you for making it so approachable with your great explanation! thank you for sharing in this lovely give-away! Thanks for sponsoring a great giveaway! 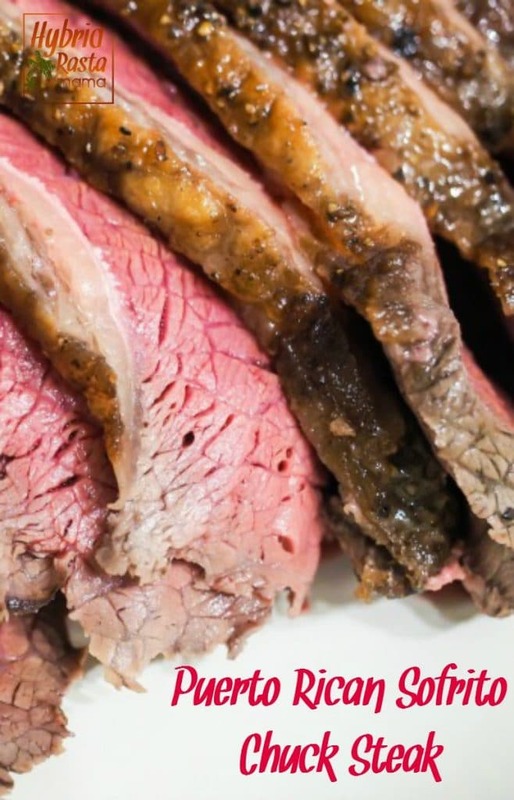 From a person that either burns or undercooks her meat, the SousVide looks like a dream to use…along with that recipe. My neighbor is from Guyana and uses something similar on all her meat to marinate, very similar ingredients and she always gives me a jar to keep in the fridge, I use it on everything from chicken to steak before cooking. 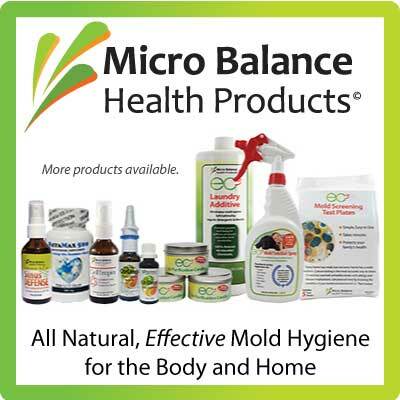 Thank you for doing this great giveaway – what a fantastic line-up of very useful products! I would love to win any of these, but especially the dehydrator or the blender. What a great giveaway! I would love to win the Excalibur so I can dehydrate my sprouted wheat berries. Thanks for the giveaway! I just heard about sous vide this week at a restaurant we went to. It would be fun to win that and try it at home. The sousvide seems really interesting, but out of reach financially, so I’d love to win that. The dehydrator would be great too. Any of these would be awesome but the Blendtec is first on my list. Thank you for this opportunity! I would love to win the Blendtec! Have been wanting one for my healthier food journey but they are so expensive! Any one of these would be put to good use at my house, my kitchen tools are woefully lacking and I’m really getting into gardening so I need all the help I can get. Would love to win the dehydrator or blender! So glad you all got together for this awesome giveaway! Thanks for the great givaway! I love the cheesemaker! I would love the cheesemaker. I have been making soft cheeses for the past six months and I want to try my hand at harder cheeses such as cheddar. I would love the Culturing Package! The recipe sounds amazing!! Thank you for such a great giveaway, if I had to choose out of the amazing products, I’d like the Culturing kit. the Sous vide system sounds like the answer to my beef cooking challenges. l would prefer The Kitchen Culturing Package! I make butter and have many times wished for a mold, I have tried to make homemade vinegar, and am getting discouraged with my cheese-making abilities. This Giveaway is exciting! Would love the dehydrator or the sous vide – everything looks really great! I would love to win the fermenting package, because you can never have too many mason jar accessories. Or can you? Would love to win the Blentec for it’s awesome abilities! Of course any of the other gifts would be GREAT too! What an interesting post! Sounds like a very neat way to cook and one I would love to try! Decisions, decisions… it is hard to decide! The Excalibor Dehydrator would be awesome to have, but I’d be extremely happy with any of them! Thank you for sponsoring the giveaway and your review of the SousVide. I especially like your use of sofrito, which is a staple for many of the recipes we use. I would love to win the Blendtec or the Kitchen Culturing Package because I have never had a good blender that will do what I need it to do, and I’ve always wanted to do culturing but have been too chicken to try it. Thanks for participating in this giveaway. I’m hoping to win the Culturing package! Something very similar is already on my Christmas list, but I’m not sure how my (non-alternative) family will view it. Thanks! Dehydrator! And culture kit. And… all of it really! Thanks for the giveaway! I’d never heard of this product before and your recipe sounds great. If I had to choose a product I’d pick the Blendtec. Lusting after the Blentec – I had the chance at tasting food done up in a Vitamix, it was so smooth and creamy! I can’t wait to get one of these tools in my kitchen. Also the dehydrator – I used to do my on WAP Crispy Nuts but have stopped since it takes up so much time and space in the oven. I’d love to get back to them with the dehydrator I used to do my on WAP Crispy Nuts but have stopped since it takes up so much time and space in the oven. I’d love to get back to them with the dehydrator. All the others – yes please! Give me tools to assist my healthy lifestyle! I thought I wanted the dehydrator until I read this. Would love to win the whole package but could really use a blender desperately. I would love the sous vide. I have had my eye on this for some time now. I have a Vitamix and HATE it! I have always wanted a Blendtec, but we invested so much money in the VitaMix that we can justify the cost of a new machine. I am a personal trainer and always encourage my clients to eat healthier and I would love to have the Blendtec to experiment with new recipes to share with them. Thanks for a chance to win some great prizes. I have a quarter of beef coming soon and I would love to use a SousVide to preserve it! That steak sounds fantastic. I am so fascinated by the idea of this cooking method and I really want to get into it. Thanks for explaining so much about it. My top choice is the culturing set, but I sure wouldn’t cry if I won a SousVide! I don’t cook much meat at home because I’m not very good at it. That would change if I had a SousVide. Hi! Thank you for the chance to win. I love all the items. Have a blessed holiday season. Visiting from Common Sense Homesteading to comment. This is the second review I’ve read of the Sous Vide but I do not have room for one more appliance. I thought that the dehydrator was my first choice, but now I think that the sous vide sounds amazing. Thanks for sponsoring such a great giveaway. I’ve been wanting the Blendtec but I haven’t been able to afford one yet. I would love to win it! Thanks for saying that the SousVide does not contain BPA and are phthalate free. Looks like a great system, but I was worried about the plastic. Thank you! Thank you so much for this opportunity to win some awesome kitchen appliances! while I find the SousVide interesting, I would really love to win the culturing kit! 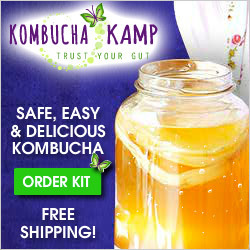 I am trying to add more fermented foods to my diet, but getting all the equipment to do so is costly. This would be perfect! I’d love the dehydrator. Or the blendtec. Or the culturing kit. Or… I’d be excited to win any one of them, truthfully. I am absolutely fascinated by this. I have always thought of Sous Vide as something that only happens on those cooking shows like Iron Chef… The notion of trying it myself has me quite intrigued now. Thanks for sharing your experiences, and for hosting the giveaway! I have never heard of the SousVide Supreme before.Thanks for a really good explanation of the product. I would not mind winning it now that I know what it is. I would love to upgrade my dehydrator to an excaliber!! Thank you for the opportunity, I would love a Blendtec! I love this giveaway that all of you ladies are doing for others. I am having a hard time choosing which is the one I really want, but it comes down to the dehydrator and the culturing package. What a blessing it would be on this journey my family has delved into, on eating right. This would surely be a great blessing! Thank you again! Wow, that recipe sounds delicious! What a fascinating way to cook one’s meat. Definitely solves the dry / tough meat issue. I just saw a roast with marinade cooked like this and it just fell apart. Deeelish…. This is an awesome review of this water bath cooking method. I have not ever seen this. I must be living in a cave! I have cooked Chuck Steak for years and had great dinners with steaks cut at 2 inches thick. As for the chuck roast sometimes I will marinade them over night and grill them. I generally cook with natural charcoals in a Big Green Egg. Big roast will often be cooked in a cast iron camp dutch oven. They come out almost melt in your mouth tender. Never stop learning new ways to cook. Okay, well if I have to choose just one to be really excited about, I would have to go with the Blendtec blender because we are smoothie people and I use my blender for making dressings, salsa, pretty much anything. But I have always wanted to try dehydrating my own fruits and vegetables. I have heard great things about the Excalibur, but haven’t had the opportunity to splurge on one yet. What a great giveaway. I’d enjoy winning any of those prizes. Thanks for the thorough review of the SousVide. They are all great prizes, but I think I would like the Traditional Kitchen Culturing Package the most. I have been reading up on home fermenting and want to try it. This package would help with that and you get the added bonus of culturing butter AND cheese making! That’s totally cool!!! The Sous Vide is on my wish list. I love the versatility. I would love to win the Blender or the dehydrator. I would never have known what a Sous Vide was without this post! I’m intrigued, but I doubt it would be large enough to accommodate cuts of meat large enough to serve my large family. Such a hard choice between such fantastic prizes! I’d select the fermenting/culturing package as my top choice, with the Blendtec or Excalibur as runners up. I’m really pursuing more cultured veggies in our diets these days. I’d love the Dehydrator, fermenting kit or Sous Vide… Thank you for the recipe! I would love to win the Blendtec! Thanks! This is a wonderful give a way! I would definitely put the culturing package to good use! I need to chose only one item? I guess that would be the sealer. I have been wanting one for awhile and I think I would get the most benefit from one of those. The Excalibur dehydrator would be my choice. I love dehydrated foods but would like an alternative to making them in my oven. I would love any one of these but the dehydrator would be my first choice. Thank you for your very informative blog and recipes. I am new at this and tannin it in as fast as I can. I would love the dehydrator. Mine just went to dehydrator heaven and I have no way to dehydrate fruit. I’m torn between the Sous Vide and the Blentech! Can;t wait to try your recipe! Happy Thanksgiving! I would put all of them to use! My choice would be Blendtec but all are great – thanks for this giveaway! Fabulous stuff! Would be lovely to win one! Thank you, Jennifer, for sponsoring this wonderful giveaway. I appreciate all the hard work you put into researching healthy, holistic living and sharing with us recipes and other information. Any of these appliances would be a great addition to my kitchen, however the culturing package would be a most helpful tool for making cultured foods for a healthy gut and body. Happy Thanksgiving! Hey! What would I love to win? Besides everything? The.most awesome would be the cutting board and wax, I’d think. Cutting/chopping/hacking-in-a-theraputic-manner… What could be more relaxing??! Thanks much for the give – away and so many opportunities to enter! Your steak recipe sounds so awesome that I am going to try it out on my family. I love all of the spices in this recipe which really add to the flavor. To be honest, I would love any of the gifts offered in this giveaway. I would really be excited to try the SousVide Supreme Demi Promo Pack to save money, time and make some great meals. Awesome giveaway!! I love all the products, but to chose one..would have to be the dehydrator!! Thank you so much for this opportunity!! Love the recipes too..YUM! I would love to win the blender for my daughter! I would most like to win the Blendtec or the dehydrator. blendtec/culture package/sous vide…not nec in that order?!.. I’d like to win the Sous Vide. My sister has one and loves it. Would love to win the Blendtec for smoothies…or the culturing kit…or the cutting board…or any of the above, really! Thanks for co-sponsoring such a great giveaway! I would love to win the Excalibur 2500ECB 5-Tray Economy Dehydrator because I would love to be in control of the snacks that I eat. I can hardly wait to begin dehydrating!! Thanks for sponsoring this giveaway!! It’s hard to believe there are still things I need in my kitchen. I already have so many appliances but I don’t have any in the giveaway. i would love them all but am especially interested in the sous vide and I’d love a better blender. What an amazing prize package. I guess with the soups vide cooking I would have to plan ahead a little more, 36 hours is a long cooking time! I would love any and all of them, they are wonderful prizes, but my pick would be either the Sous Vide or the culturing package. Those would both make great additions to my kitchen. I would love all of them but especially the dehydrator since mine died. I would be excited to win any of the great prizes being offered. Thanks for the chance. Delicious recipe and awesome giveaway! I would love to win! I would really love the dehydrator!